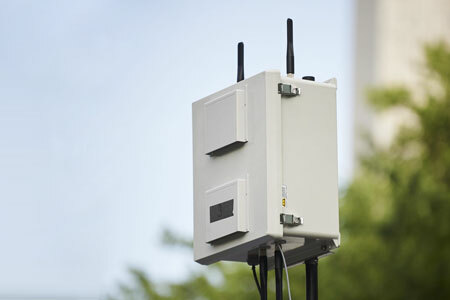 AirWarden™ is an advanced drone detection system that identifies and classifies RF drone signatures with multi-protocol and full frequency support. AirWarden™ detects popular, ready-to-fly commercial drones, custom “kit” or Do It Yourself (DIY) drones and even a swarm of tiny micro-drones. As long as there is an RF signal, users receive email, text (SMS) or control-room monitor alerts when AirWarden™ detects drone presence. Detection range is equal at least to the detection range between a drone and a controller. This means if a drone and controller can connect up to 1 km apart, AirWarden™ can detect at 1 km or slightly more. If a drone and controller can connect at 5 km, AirWarden™ can detect at 5 km or slightly more. The AirWarden™ open architecture allows communication to/from other systems such as an organization’s existing alarm monitoring or reporting system. AirWarden™ is unaffected by lighting, sound, weather, background clutter or line of site making it suitable for air, ground, and marine UAV detection. Lower maintenance and fewer sensor requirements combine to result in a lower total cost of ownership. Optical systems require line-of-site and perform poorly in low light, fog, cloudy, rainy, snowy, or cluttered background environments. The camera lenses must be regularly cleaned to remove dirt. Infra-red, or “near” infra-red cameras supplement optical systems for night-time operation. They also require line-of-site. Acoustic systems perform poorly in high wind and other high-noise environments. Parts for these systems oxidize and must be inspected and replaced on a maintenance schedule. Line-of-site required for them also. If an RF detection solution “decodes” or “demodulates” the signal to extract the drone type, GPS coordinates or the “Return to Launch” GPS coordinates, it violates US Federal Wiretapping laws. Rest assured, AirWarden™ does not decode or demodulate.